Many people think that Tarot is about asking a question, shuffling the cards, and doing a reading – and that’s that. But guess what? When you start to bring Tarot into your everyday life, you create a gateway for something amazing to happen. As you begin to listen to your intuition, you connect with your inner power and manifest the future you most desire. 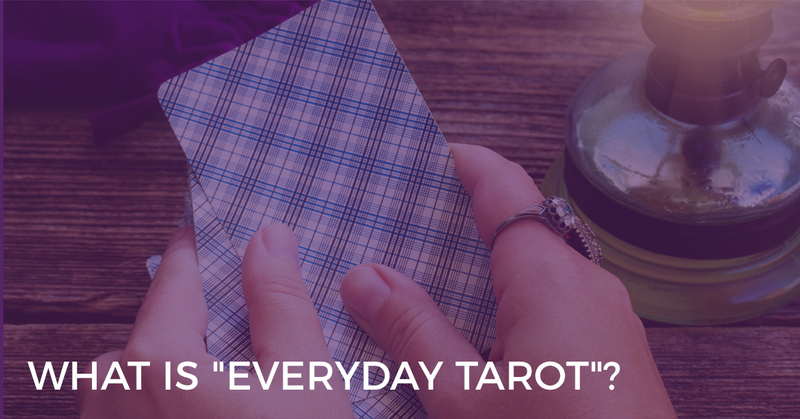 So… what does ‘Everyday Tarot’ really mean? Great news! That’s what I’m talking about in this post. When I started learning Tarot, I focused on mastering the Tarot card meanings and reading with confidence. 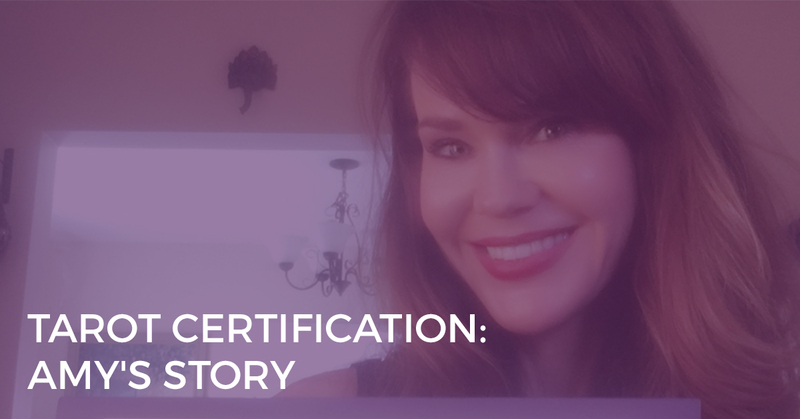 My goal was to do a Tarot reading from start to finish, without going blank or worrying whether I had it right. I wanted to create an accurate and insightful Tarot reading using the cards and my intuition. I then put my energy and attention into reading Tarot for others, as a professional reader. I read for over 10,000 clients worldwide and it quickly became a reliable source of income for me. But, in the last two years, I have moved away from reading Tarot for others and am back to reading Tarot for myself – this time, in a whole new way. Instead of worrying about choosing the right spread or finding the right meaning, I’m engaging with Tarot in a much more fluid, intuitive, everyday way. And instead of reading other people’s cards, I’m teaching those people how to read their own Tarot cards and connect with their intuition. You see, I believe it is so much more powerful when you discover the answers rather than have them read to you by someone else (as typically happens in a Tarot reading with a professional reader). Now, I use Tarot throughout my day to help me become more mindful and intentional, make better decisions, and manifest what I truly want. Tarot has become an integral part of my everyday. Imagine this… Your bestie invites you to the movies on Wednesday night. But just as you’re about to say yes, your sister begs you to look after her kids so she can get a well-deserved break. Not wanting to choose between your bestie and your sister, you pull out your Tarot cards, hoping they will make the decision for you. 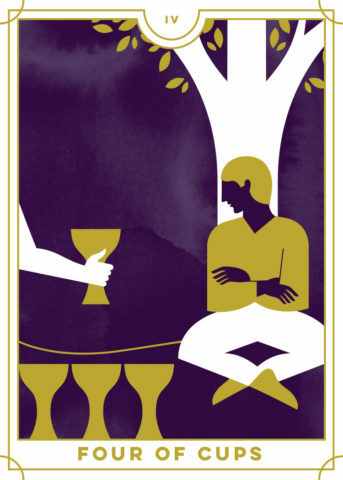 Four of Cups for the movie with your best-friend, and Ten of Pentacles for your sister – decision made! Raincheck the movies, and go and help your sister. But then your best-friend is upset with you. Outcome: the Tarot cards again, this time you ask, “What’s her problem and what should I do?” And so it goes on and on… consulting the cards every time life becomes ‘hard’ and hoping the Tarot will make the decision for you. 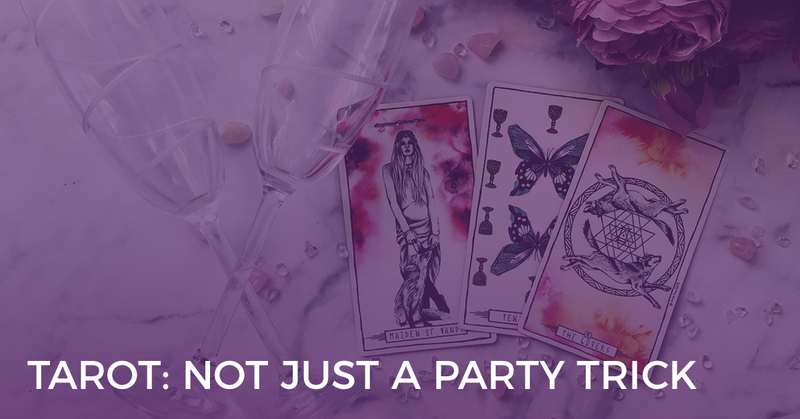 So… Everyday Tarot is not about becoming completely dependent on your cards to decide what to wear, where to go, what to do, or how to start your day. In fact, if you find yourself desperately grabbing your cards every time you have to make a decision, then it’s probably a good time to put your Tarot cards away for a while! Everyday Tarot is not about handing over your power to the cards or to ‘fate’. Don’t believe that you can only ever get the answers you need by consulting this external source. Your true power lies within, and so too do the answers that you’re seeking. Tarot is merely a mirror to your soul, a tool to reflect what’s going on inside of you, rather than an external source of information. 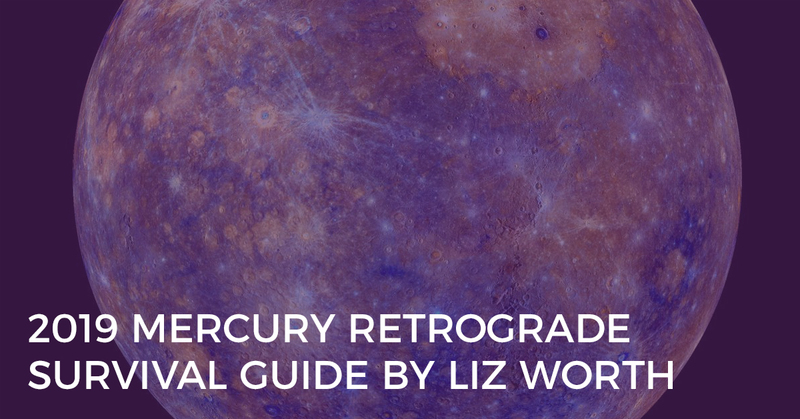 Tarot won’t solve your problems for you – that’s up to you. But it will help you see what your problems may be, including your blind spots. This new vision is what will help you create the life you most desire. Now that we’ve got that cleared up, we can finally delve into it. What does ‘Everyday’ Tarot really mean? Before your friend and your sister have even called you, you’ve started your day with a Tarot card – the Two of Swords. You know that today, you’re going to need to weigh up your options and look at things from a new perspective. So when your friend invites you out and your sister starts pleading on the phone, you’re already prepared. You come back to the lesson of the Two of Swords and you know you need to tread carefully. Facing a tough decision, you might ask the cards for guidance on what’s happening in this present moment, and you draw the Ten of Cups. 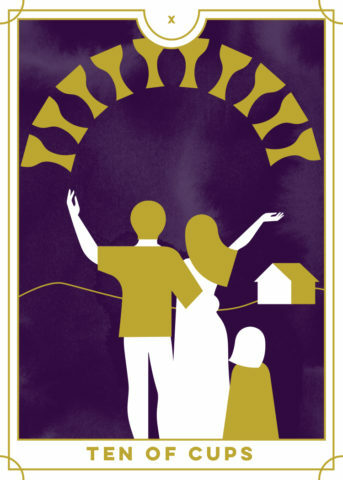 As you connect with the imagery of the card, you remember the bond you have with your sister and that blood is thicker than water, so you make a conscious choice to honour your sister’s request. You know ultimately that the decision is yours, but you appreciate the opportunity to check in with your true feelings about the situation. To me, Everyday Tarot is about bringing inner wisdom, higher levels of consciousness, and sacred intention into your every day. It is about using Tarot in a way that supports your ongoing alignment to who you really are. Everyday Tarot is a partnership between you and your intuition. Instead of immediately grabbing your cards, you first consult your inner self for the clarity you are seeking. If there are still blind spots or unknowns, then your Tarot cards help you go deeper, bypassing your conscious mind and entering your subconscious mind so that you can unlock your innermost wisdom. Tarot is what holds you accountable to your Divine Being, and ensures that every action you take is in alignment with who you really are and why you are here in this lifetime. Everyday Tarot is about consulting the cards – and your intuition – about everyday things, from setting your daily intentions, working through a conflict, making decisions, and mapping out your next steps. It’s about taking your Divine wisdom and applying it to your everyday life, making it ‘real’, practical and truly accessible. When you practice everyday Tarot, you practice the art of listening to your intuition. You lead your life from a place of trusting yourself, owning your power, and being intentional. You process things rationally – but also intuitively. Intuition plays an important role in your life – it’s not just a froufrou thing on the side. This, my friend, is Everyday Tarot. Make every day an intuitive, connected, and aligned experience where you are making conscious choices about what you create. Open your mind, your heart, and your intuition—even just a bit. Even when it feels like it’s getting too “woo-woo” or weird, just keep an open mind and give it a try. Be ready to go deeper into who you are—the good, the bad and the ugly. Trust that you have everything you need. All the answers lie within. Honor yourself and make time for you. Even just five minutes a day can impact your well-being. See Tarot as a part of your life, not just for “doing readings” but for integrating into your everyday being. Forget about doing it right. There is no “right” with Tarot. It’s about trusting your intuition and doing it your way. Be ready to ask, Who am I? And how can I live life to my fullest potential, in alignment with my Highest Good? There is no end to how you can use Tarot—it’s up to you and how it will best serve your Highest Good. But what I do know is that there’s no better time than right now to strengthen your connection with your intuition. If you want to find out more ways to integrate Tarot into your everyday life, check out my Everyday Tarot book and deck.